Experience Drummond Island with a Yacht Haven getaway! Enjoy spectacular Potagannissing Bay views as you relax in your private Up North getaway! 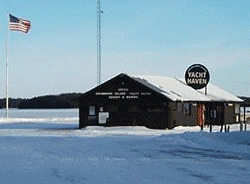 Snowmobile the Island’s 100+ miles of groomed snowmobile trails. Cross-country Ski any of the three groomed, marked trail systems. Snowshoe the trails at the Township Park. Skate on the rink at the Townhall. At the end of a long fun-filled day get cozy in front of your own private fireplace! Yacht Haven’s cottages fill up fast. Call to book your getaway today! Yacht Haven’s 3 and 4 bedroom cottages are nestled in the wooded shoreline with beautiful views of Potagannissing Bay and the islands surrounding the north shore of Drummond Island. Three and four bedroom cottages have native limestone fireplaces with wood and kindling at no charge. Our four bedroom cottage features 2 bathrooms and a hot tub on the deck overlooking Potagannissing Bay – relax as you enjoy either an early morning soak enjoying the sunrise, or an end-of-the-day wind down as the sun sets in the west – this deck provides an unbelievable panoramic view of the Bay. All cottages come equipped with satellite TV and pets are welcome. Phones are conveniently located. Fresh linens, towels and kitchen utensils provided.